In the course of your work, you might have received or even written warning letters yourself. 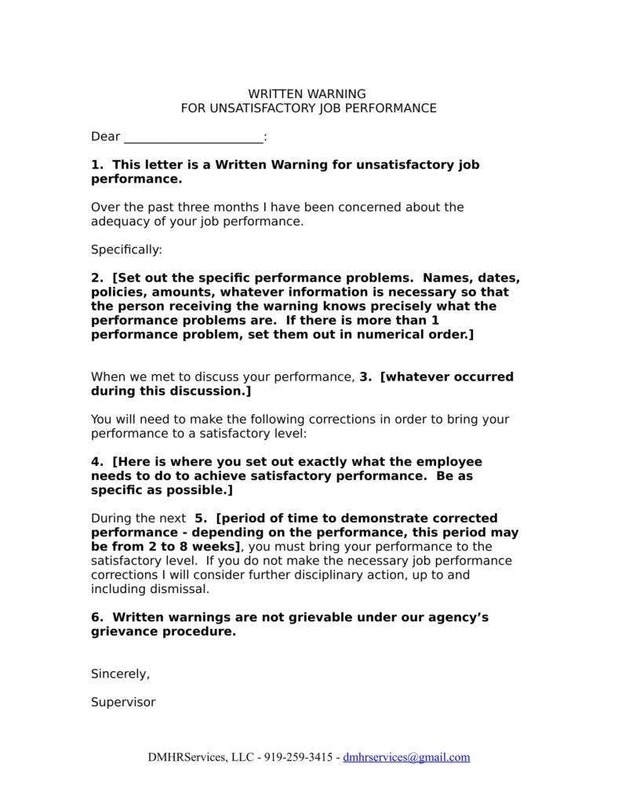 This does occur, being that Hr HR warning letters make for useful tools for maintaining discipline in the workplace. So if you yourself are in a managerial position, you might want to know how best to make use of such tools for your own work. After all, like other tools, there are some proper ways of using examples like official warning letters. In order to make the most of such documents to fulfill your responsibilities, you would need to be aware of such things as what to include in your company warning letters, as well as some miscellaneous writing tips that can improve your flow of writing. First, start with your company letterhead. 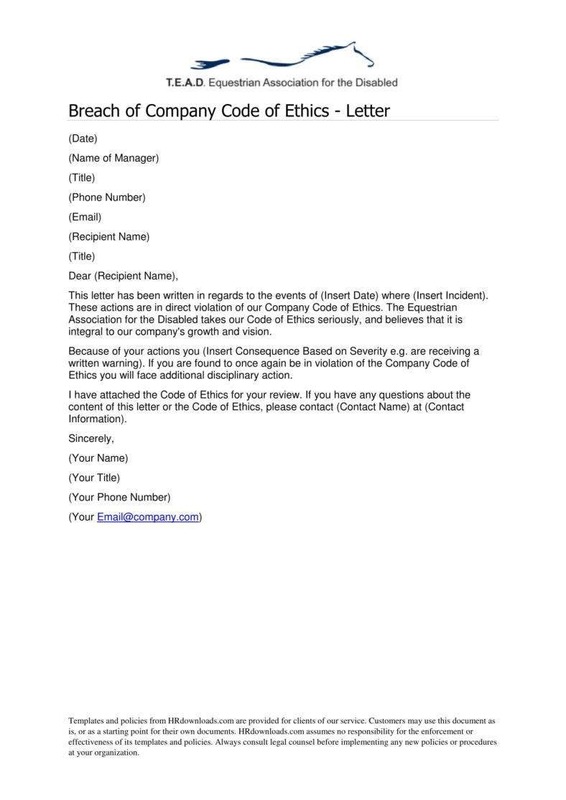 Any kind of official letter always needs to include the company letterhead so as to help associate the document with the company, as you may have seen in other warning letter examples. Being that you will no doubt be sending your letters on company business, it is important to do this so as to give your letters’ content the weight of the company behind them. After all, if your letter is to be taken seriously, it is best to comply with all the necessary forms. Be sure to include both yours and your recipient’s personal information. Another thing to include in these letters is the proper personal information of everyone involved with the subject of your letter. This serves to make the principal parties clear before ever reaching the content, leaving no ambiguities about who is involved. This also serves to make the recipient understand that he himself needs to be notified of something, and with you specifically, which he ought to have some concern about. Lead with the subject right away. All official documentation, including staff warning letters, should always introduce the subject immediately. This is generally reflective of business culture in general, in that you never wish to take up more of a person’s time than necessary. The same applies here, as your main priority would be to get to the point immediately so that you can start taking steps to address the issue. Be sure to mention the specific instance. When making these kinds of letters, it is vital that you include exactly what actions the recipient committed so as to make his offenses clear. This is especially the case with first warning letters, as there is no established pattern of behavior yet. Either way, you need to specify the offenses themselves so as to be able to bring them to the recipient’s attention properly. Make sure to include the date on which the action was committed. Part of the specificity of naming the recipient’s offenses is making sure to include the dates on which they occurred. This helps to help the recipient more aware of what he did, and when. In addition, this also makes it easier to establish a record of such patterns of behavior, which may become useful in the event that similar incidents happen in the future. This can be useful in either attempting to rehabilitate your employees or in the event of legal action being taken against you. Also be sure to explain the gravity of the offense. Part of taking steps to prevent this behavior from occurring would involve explaining how the offense affects more than just the recipient and his immediate surroundings. You need to state clearly just how these infractions cause damage to the company as a whole in order to let the message sink in. This can help impress upon your recipient the sheer gravity of the offense in the hope that it does not happen again. Make sure to include disciplinary measures. You should make sure to include whatever disciplinary measures would be necessary for the infractions in question. After all, you would still have to maintain discipline, and that entails making sure that you include such measures. Also be sure to include the dates, especially in the case of any meetings to address the issue. If possible, also be sure to include any expectations you have for improvement, so as to give your employee concrete goals to work toward. Also be sure to include warnings of any consequences that will occur, in case of repeat offenses. It is also the job of job warning letters to provide fair warning of what to expect if your recipient should continue to persist in such behavior. This serves to keep your employee aware of these consequences, up to termination of employment. Your employee may actually benefit from having the matter put in perspective in such a manner, as this may help to keep him in line. Include an offer of help in closing. As a manager, part of your duties includes assisting your employees to reach their goals as members of the company’s workforce. After all, the job is not always about punishment and discipline. As such, you should make yourself available to employees so as to be able to speak with them and try to help them through the problem. Of course, this is for the benefit of the company as a whole, not necessarily for personal reasons, as this can help improve employee productivity and morale in general. Be sure to end with your name and signature. This is another important element of writing these letters, as it is also important to make sure that the letter has the proper authority behind it. Adding your signature is meant to add your seal to the document, to prove that it has the weight of your authority behind it, and that it ought to be taken seriously. 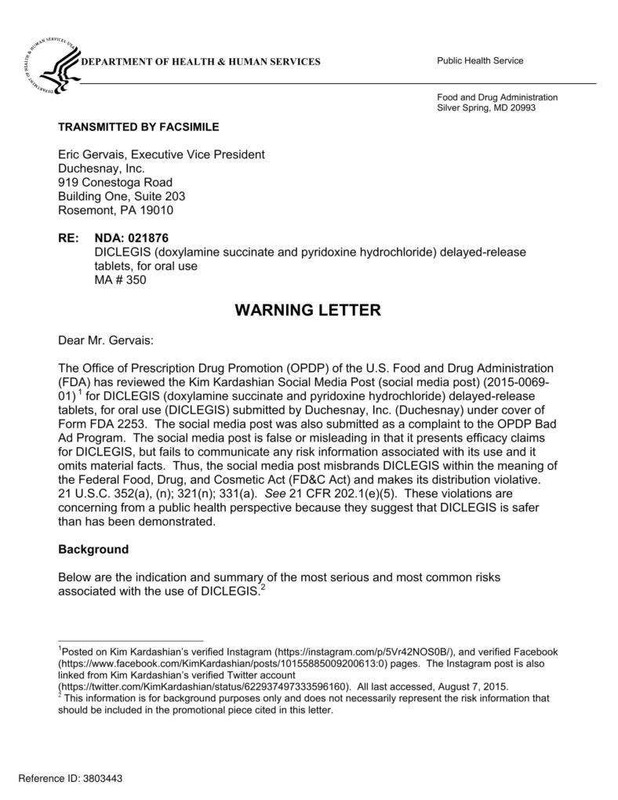 What Specific Work Warning Letters Are There? You may have noticed different simple disciplinary letters available for you to work with. After all, like other documents, there are a number of different tools you can use, including letter templates and disciplinary warning letter tips and samples. 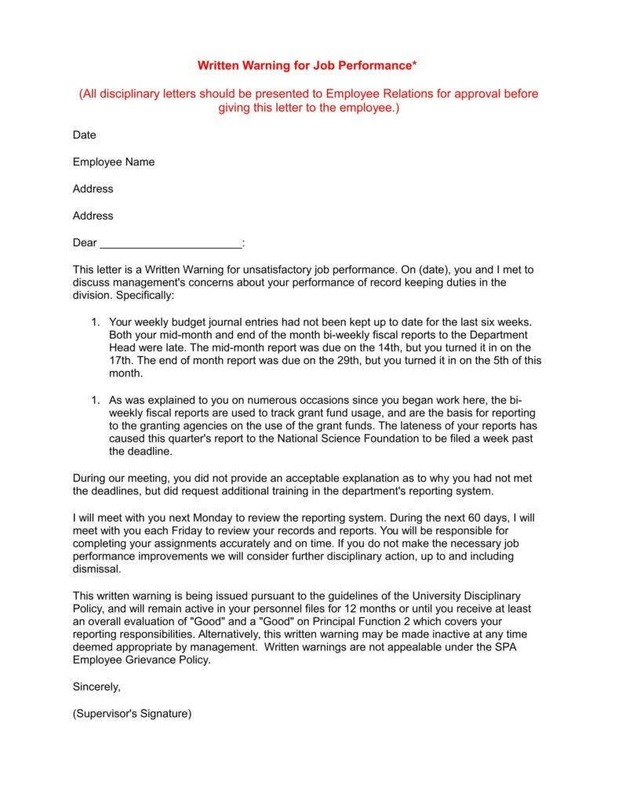 It might help you to know exactly what kind of work warning letter templates you might be able to work with. 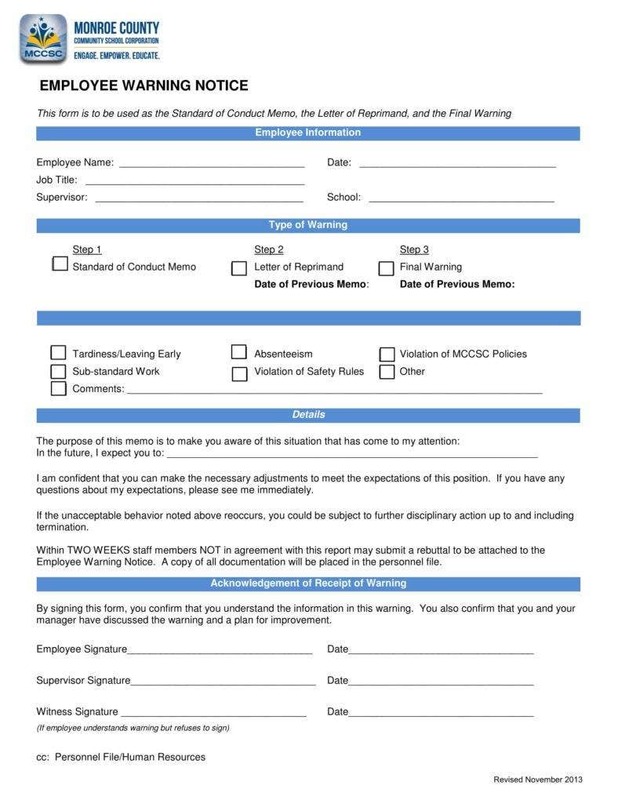 This kind of warning letter is a fairly general distinction in this instance, but employee warning letters can be set apart from other general types of warning letters in that they are specifically meant for the benefit of employees. 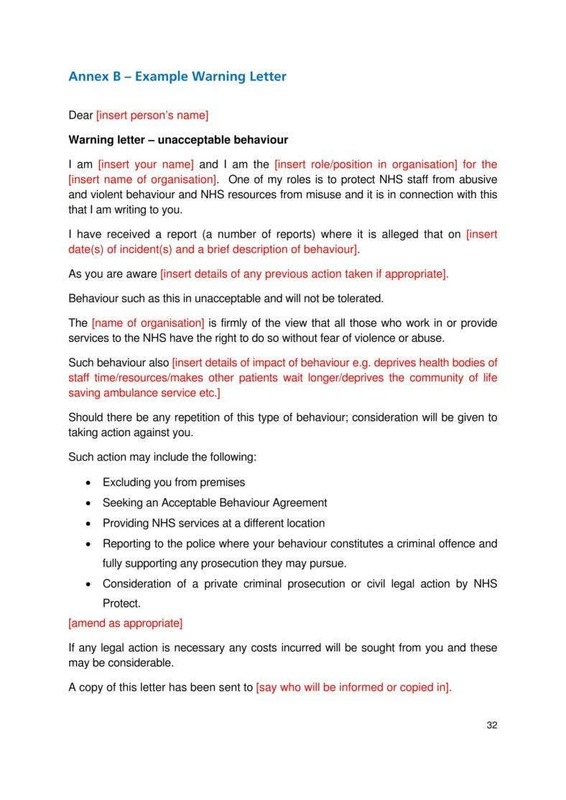 There are different kinds of warning letters, that much is a given, such as those meant for tenants or students, which would not be particularly appropriate for a workplace setting. There are some specific work warning letters that you may want to use for particular offenses committed by your employees. 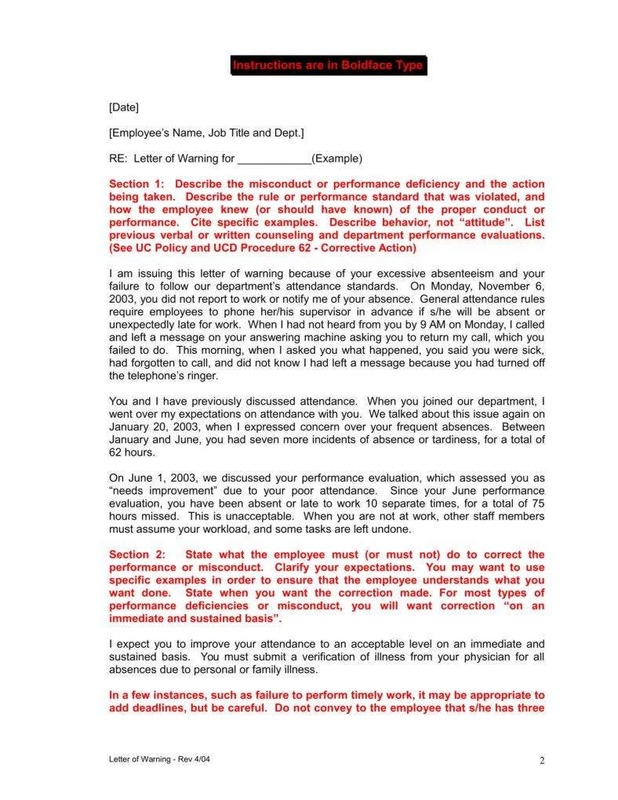 One of these is a behavior warning letter, for when employees’ behavior is the root of your issue. 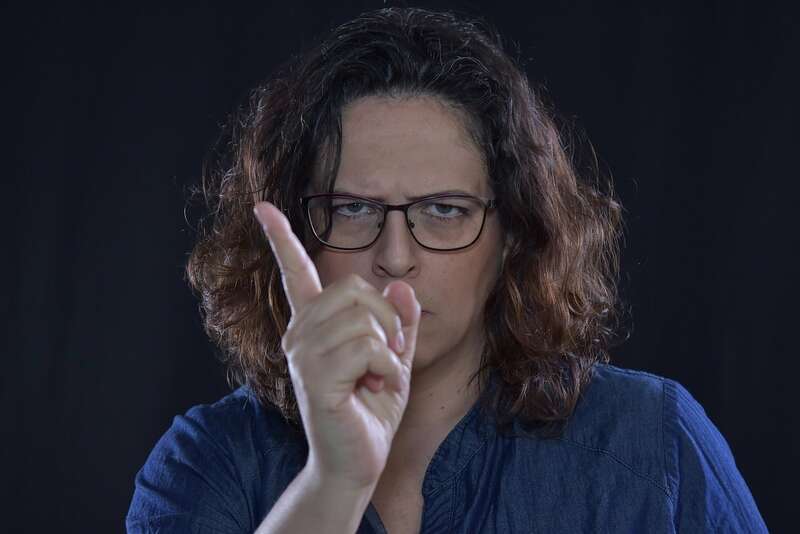 After all, bad behavior can prove to have negative effects on morale or productivity, such as in the case of excessive noise or disruption of colleagues’ work. In this case, you would need to put a stop to such behavior as soon as possible, which a specific letter could help you with. You may also have to keep an eye out for poor performance, such as a lack of productivity in your employees. 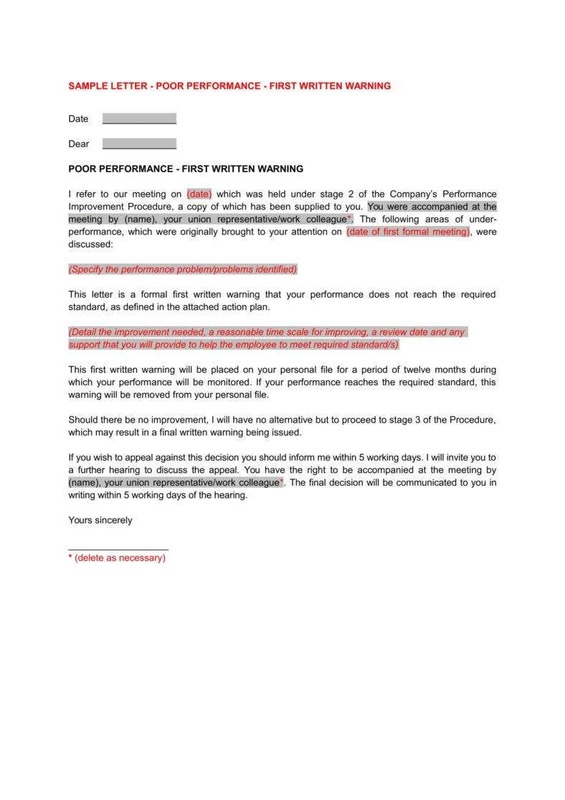 In such cases, you ought to use performance warning letters to bring the unproductive streak to their attention. This not only serves to make your employees aware of this trend but might also encourage them to come to you. This can make it easier to address the issue, particularly if it has to do with some kind of work condition, which might bring productivity up to standard levels. While this is as significant an issue as any other, this is generally less an issue of punishment and more one of guidance, which you ought to keep in mind every step of the way. Consistent tardiness is always a serious issue in a workplace, hence there is a need to deal with it before it severely cuts into productivity. 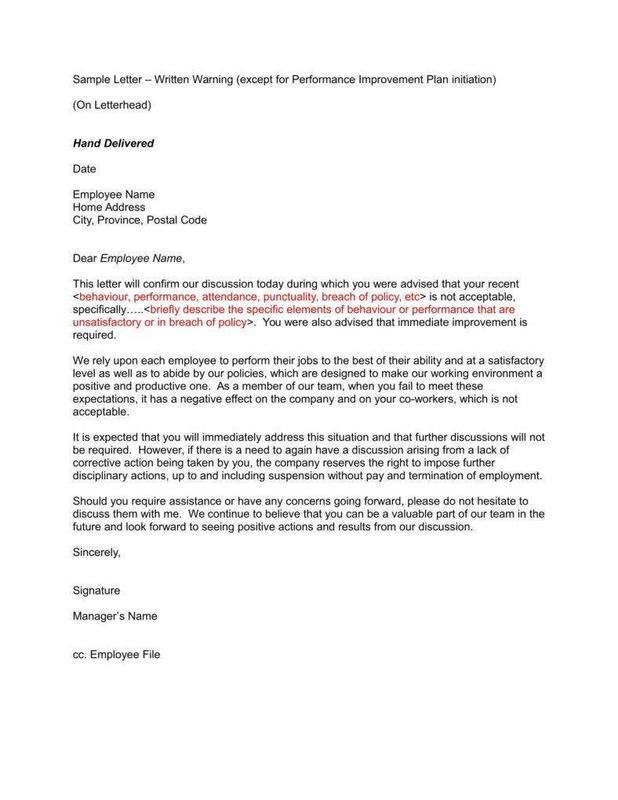 For this, you have late warning letters available so as to bring the issue to the relevant employees. 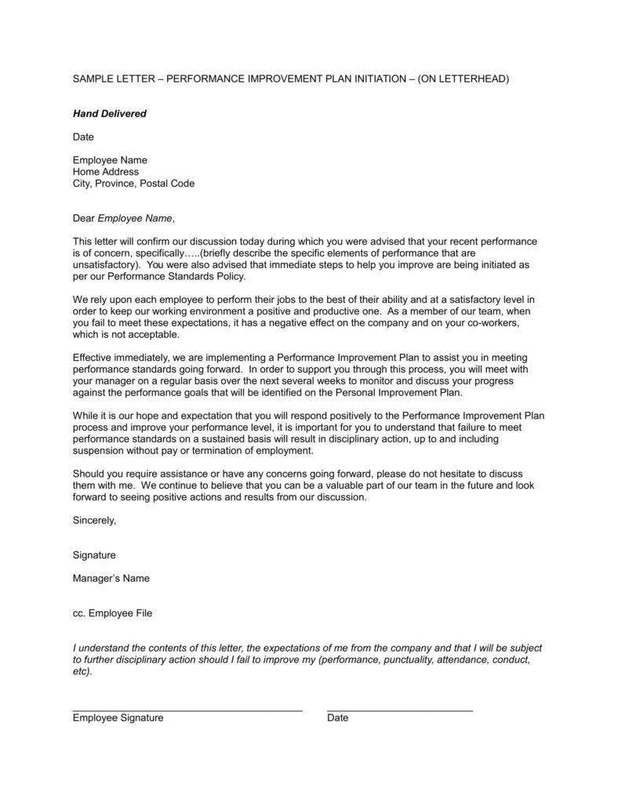 Your letters can also be more effective if you include admonishments for your employees to amend their behavior so as to encourage your employees to help themselves. After all, many cases of tardiness simply require firm discipline on the employees’ parts. At best, you may only have minimal involvement in resolving the issue. 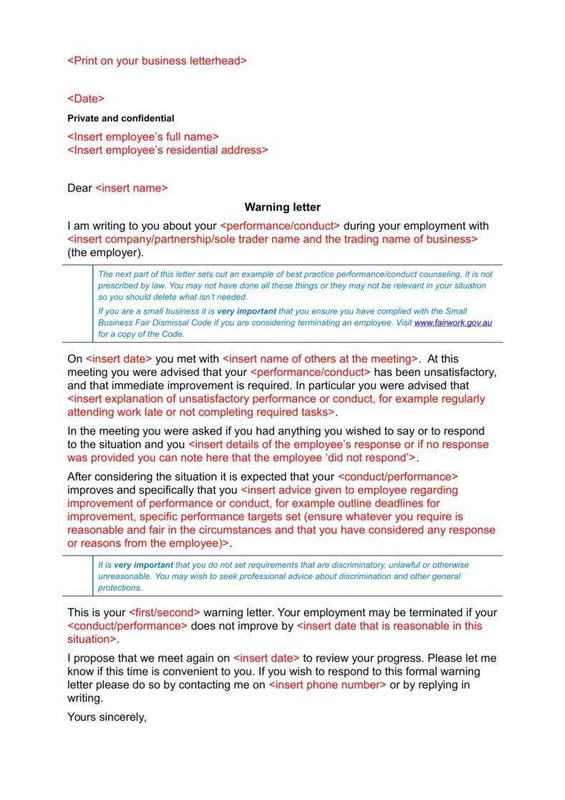 With all this, you should have a better understanding of tools like printable employee warning notices, particularly if you have to make them on a regular basis.